Pierre Bertrand has created a programme of his original music exclusively for the Latvian Radio Big Band: a selection with an atmosphere that will transport the audience to the narrow streets of Montmartre and offer a taste of bohemia. The Roaring 20s of the last century came with a lot of innovation, including jazz, radio, and cinema. Paris symbolizes the renaissance of the quarter of Montparnasse where joy and abundance were put on the pedestal of life. It’s the age of Josephine Baker, Art Deco, and Coco Chanel. The 20s and 30s were a time in Riga when all seemed possible, the little Paris is right here in the heart of Latvia, and the passions of bohemia are just as high here. The charm of Paris was mainly tied to the choice of names that were like a line to France. 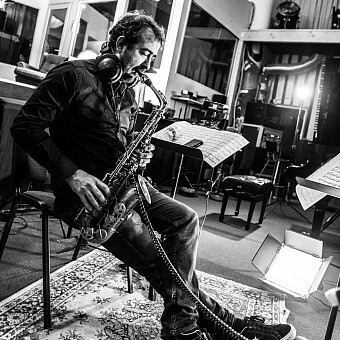 Pierre Bertrand is a saxophonist, flutist, a teacher of composition, and his works include numerous compositions and arrangements for different ensembles, as well as scores for films and stage productions. The album JOY, his most recent creation, was released under the prestigious Cristal Records label, which is a part of Sony Music. It won the highest prize in the country - Victoire du Jazz in the nomination Album of the Year in 2017. Bertrand has earned this prize previously with the Paris Jazz Big Band - Victoire du Jazz : prix Franck Ténot and Django d’Or. Christophe Lampidecchia is a French accordionist. He learnt from the greatest accordionists such as Marcel Azzola, Jo Privat, Bruno Lorenzoni. He released his first album at the age of 18. He works with famous jazz artists, Louis Winsberg, Marc Berthoumieux, or the Argentinian percussionist Minino Garay. He has recorded film music for Francis Lockwood. Christophe Lampidecchia has also worked with the well-known French singer Maurane. The soloist of the new project is the young and striking French singer Paloma Pradal. Her rigorous technic and her unbelievable seasoned voice transport her audience in a unique emotional journey. Alongside her flamenco training, Paloma regularly collaborates with artists from different musical genres: the French hip-hop band Al’Tarba, La Gale, the jazz musicians Jean-Marc Padovani and Pierre Bertrand.